Moira is my first teacher, she teaches at our local gym, Toadal Fitness. Her one-hour classes are good workouts, and include veilwork, floorwork and drum solos, a warm-up and cooldown. She will break down moves only if it turns out most students don't follow; otherwise it's pretty much a free-for-all. Fortunately, her routine changes gradually over the course of months, so if you attend frequently you will be able to follow the moves much better. A very good way to learn a wide range of moves! She encouraged me to do my first solo after about six months - thank you, good call! That definitely pushed me to put my belly dance training in a higher gear. I have done a series of classes with Sahar in Spring 2007, to learn a Tahtib choreography, an originally male dance style with sticks. We mixed 'male' and 'female' moves and performed our group dance at a local venue and at a showcase of the dance school. Sahar is a well-respected dancer in our area with distinct grace and versatility. Her class has a nice stretching routine and she takes the time to explain new parts of the choreography in a structured way. Dolphina probably does not know that she is my teacher, because I learn from her through a series of DVDs. Her DVDs are excellent material for the beginning belly dancer, and the Warrior Goddess DVD is a pretty strenuous exercise. I learnt a lot from her veilwork DVD for my first performance. After using the Dolphina DVDs I practiced with a DVD from Jillina, Instructional Belly dance Level 1. In fact, I had tried it before and put it aside because I found it too hard - this DVD is not easy enough for real beginners! I definitely learned to do some camels from her, because they are all over the place in the choreography she teaches here. The belly dance twins are also my virtual teachers through their 3-DVD series "Discover Belly dance". They are very elegant and it is a treat to see these beautiful identical twins dance together. I appreciate their emphasis on arm position and body lean. Neon has a very useful series of belly dance instruction DVDs that I have started using recently (September 2006). Her style is suitable for any dance floor (she dances on techno music, with high heels, no less), and that suits me just fine. Her instruction is very clear: it uses geometrical shapes drawn in the video over her moves on a black background to show the shape and direction of the moves. The DVDs I have are the two general belly dance instruction disks ("Instant Belly Dancer" part 1 & 2), and a disk "Belly Dance Party" with combinations. The first two disks are useful for any belly dancer to rethink and expand their move vocabulary. You should really master the first two disks before attempting the third (I know this from experience...). Watch the introduction sequence on the first DVD ("just add hot water"), it's just too cute! Fahtiem is a mesmerizing performer and teacher from Los Angeles. I took both of her classes on the 2005 and the 2006 Arabian Nights at Sea cruises, despite fair warning from previous participants . Her classes are a serious workout, but I guess I am a bit of a masochist in this respect, I enjoyed it! Must be when you come back for seconds... Fahtiem proved a very nice lady and a good teacher who gives good insights in performance skills. Looking forward to more punishment in the future! Nakisa and I had the opportunity to take a class from Kamaal when he visited Santa Cruz for a show in January 2005. He taught us performance skills and a small routine that proved very useful later on. He is a very good teacher and a pleasure to work with, and his shows are very good! We had more classes with him on the 2005 Arabian Nights at Sea cruise, where he taught us two nice duets that we have been putting to good use. Unfortunately, he seems to be retired now. I so wanted to do his double veil class! 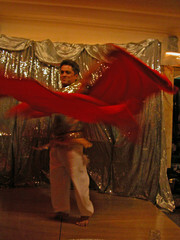 I attended a double veil class with Hassan after seeing him perform very impressively with his double veil routine. His two-hour class was long enough to teach us some good moves, and short enough to not make us completely dizzy from turning... He emphasized posture and walking as well. He is a very powerful and energetic performer with an amazing stage presence. Later I took a series of four classes with him in Monterey where he taught his veil moves in greater detail, and a choreography with his signature footwork to boot. Jim Boz is a performer and teacher from San Diego. 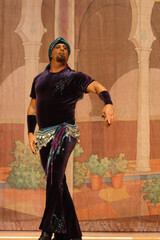 When he was here for a performance I had the opportunity to take a class with him aimed at male belly dancers in September 2005. He has a very interesting style that combines grace with power nicely, and he moves very naturally and with fluidity. He is a very positive and upbeat teacher who knows how to correct without discouraging. DaVid is also a performer and teacher from San Diego. He came to Santa Cruz to teach a couple of workshops in February 2006. I attended his Raks Sharki workshop, which was both strenuous and instructive. He has a very elegant dancing style and innovative moves, and is a fun teacher too! A very good dancer and teacher, Siwa is renowned for her costume-making skills and knowledge of stage make-up. She is the leader of the Dancers of the Crescent Moon. I did a class with her about entertaining in restaurants. 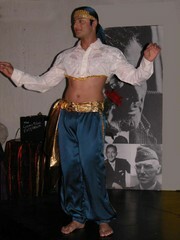 She also made my fabulous royal blue cabaret costume - now I can just stand there and pose, no dancing required anymore! 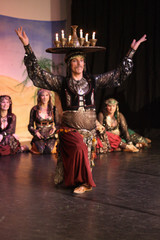 John Compton is a legend in the belly dance world. His showmanship is one of a kind, his dance technique is excellent and his stage presence is awesome. His humor and demeanor often remind me of John Cleese. 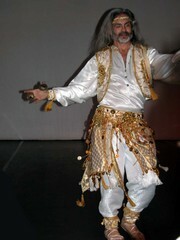 He has a passion for folkloric dance and leads the troupe Hahbi'Ru from San Francisco. I took my first class with him on the 2006 Arabian Nights at Sea cruise, and took a longer class with him when he visited Santa Cruz. 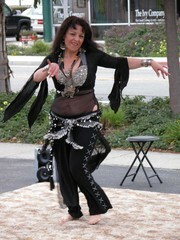 Suhaila Salimpour hardly needs an introduction to any belly dancer. The daughter of Jamilah Salimpour, who pretty much introduced belly dance to the West Coast, she studied dance from a very young age. She reached a level of perfection and grace that's very rare, and is a sought-after teacher with her own line of instructional DVDs. She invented a new technique that employs the glutes to control hip movement (instead of the knees) which allows traveling around the stage while moving the hips independently. I took a drum solo workshop with her in December 2007, and was glad I had a lot of preparation through Crystal, who's one of her students! I took another workshop with her in January 2011.